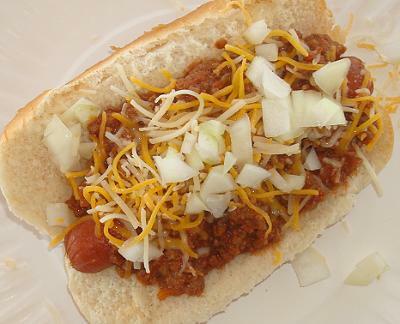 Put all the dry chili dog sauce ingredients in a small zip-loc at home to make life easier. Brown hamburger in a pot. Crumble into small pieces and drain. Add remaining chili dog sauce ingredients. Simmer and stir uncovered for 30 minutes. While sauce is cooking, put hotdogs in a pot of water and bring to a boil. Remove from fire and let sit for 5 minutes. Shred cheese and chop onion. Put a hotdog on a bun, spoon 1/4 C of sauce on top, then chopped onion, then shredded cheese.